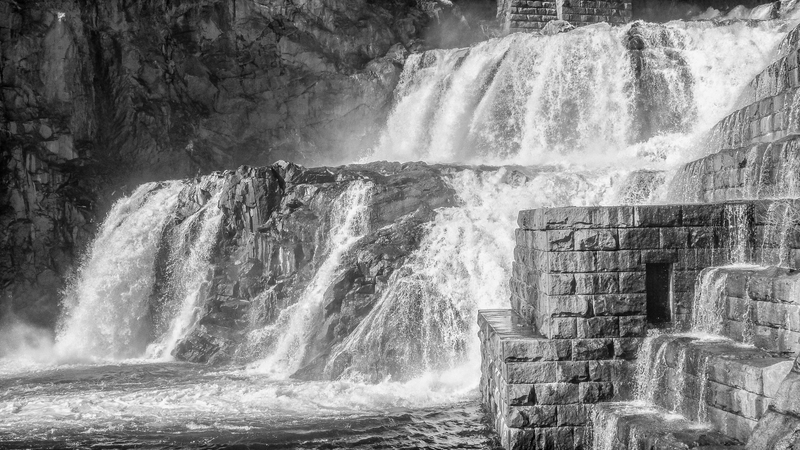 The New Croton Dam, part of the New York City water supply system, stretches across the Croton River near Croton-on-Hudson, New York, about 22 miles (35 km) north of New York City. Construction began in 1892 and was completed in 1906. Designed by Alphonse Fteley (1837–1903), this masonry dam is 266 feet (81 m) broad at its base and 297 feet (91 m) high from base to crest. Its foundation extends 130 feet (40 m) below the bed of the river, and the dam contains 850,000 cubic yards (650,000 m3) of masonry. The engineers’ tablet mounted on the headhouse nearest the spillway lists the spillway length as 1,000 feet (300 m) and the total length of the dam and spillway combined as 2,188 feet (667 m). At the time of its completion, it was the tallest dam in the world. 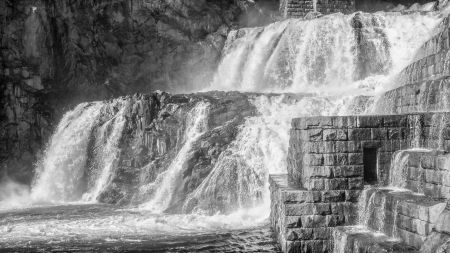 New Croton Dam impounds up to 19 billion US gallons (72,000,000 m3) of water, a small fraction of the New York City water system’s total storage capacity of 580 billion US gallons (2.2×109 m3). The dam, in Westchester County, has an unusual spillway, part artificial and part natural, which forms a waterfall on the north side of the structure. 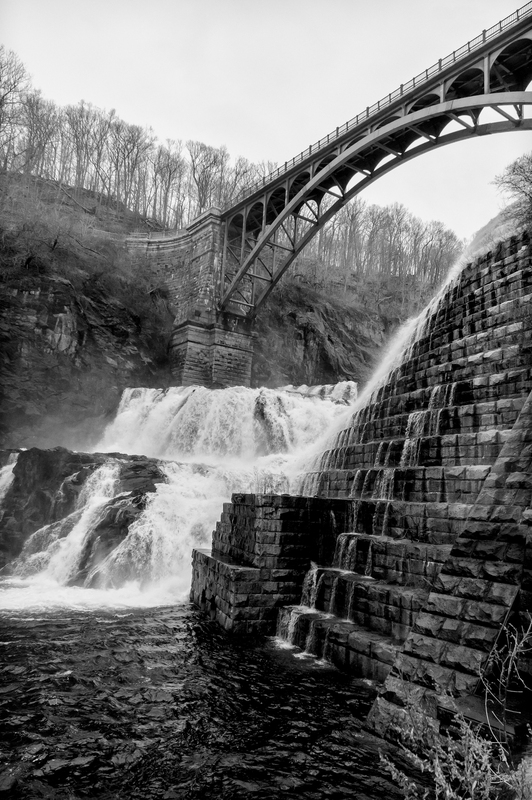 New Croton Dam has a public park and trail head at its base and a road along its crest. Road use is limited to pedestrians and emergency vehicles. 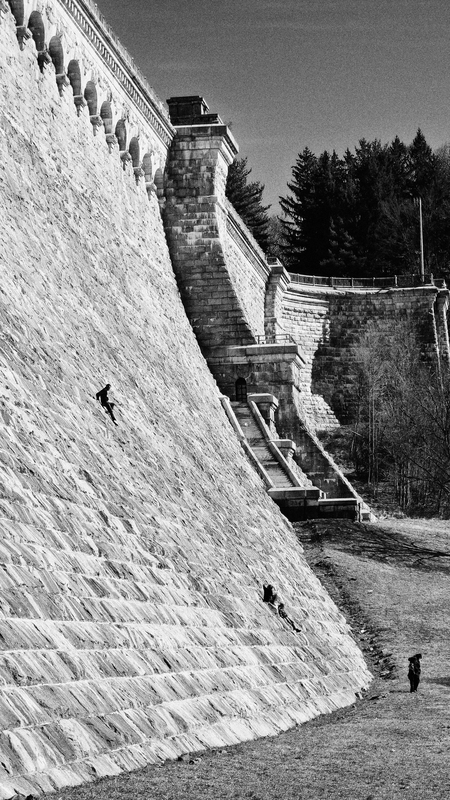 The people climbing up the face of the dam give a sense of scale i.e. just how high it is. This entry was posted in Cameras, Panasonic Lumix ZS3, Photography, Places, Sony Alpha Nex 5N and tagged gallery. Bookmark the permalink.